We fought the law and the law... did not win. A few weeks ago I spotted some guys from the utility company looking at our trees. They come by once a year or so to prune branches away from the power lines, but this time they were putting orange bands around 10 trees in our front and backyard, marking them to be cut down. These things are enormous, like 40+ feet. Besides the fact that mowing down all the vegetation between our house and the power lines would make our view ugly and decrease our property value, they also wanted to leave the stumps and all the wood for us to take care of. This seemed excessively aggressive, seeing as the trunks themselves weren't in the electric company's right-of-way, just the branches were. When we complained and they sent out a guy from the forestry department, I watched Phillip go out to talk to him in the driveway. Eventually, the forestry guy started removing the orange bands from the trees, and Phillip came back in sporting the exact posture of a silverback gorilla who'd just successfully defended his territory. So the trees are staying. The health teacher sent an email with a permission slip for a movie the kids are going to watch in class. I was not thrilled about this particular movie and some objectionable stuff in it, and definitely didn't feel good about my 12-year-old watching it. I signed the permission slip 'no' and then spent a ridiculous amount of time putting together a measured, eloquent email letting the health teacher know why I didn't think this movie was appropriate for 7th graders. Less than a minute after I hit 'send,' the health teacher emailed me back trying to say as politely as she could, "Um, this is for the high schoolers." You guys, I read the email wrong! It was for my 9th grader. I don't even know why I assumed it was for my 7th grader. Upon looking again, the subject line of the email clearly said HIGH SCHOOL HEALTH. I was so embarrassed. I will have kids taking health from the high school teacher for the next 16 years, and every time that lady sees an Evans she'll be like "There's the kid with the mom who has no idea what's going on." But then I realized stuff like this happens to me all the time and you know what? It's actually just funny. The thing that also made me feel a little better is that when I mentioned the movie to my 9th grader she made a face and said, "I saw part of that once and it made me uncomfortable. I don't want to watch that." So the only thing I had to change on the permission slip was the name of the child. I may have too many kids to tell them apart, but at least I know an inappropriate movie when I see one. I was in the car with my toddler and preschooler when we saw 6 police cruisers speeding past in the opposite lane with their lights flashing. Practically dislocating his shoulder, my son pointed and flailed wildly while yelling, "Look mom! Where are they going?" "To a big emergency, I guess." He thought about it and said, "Probably a house with 6 robbers in it." 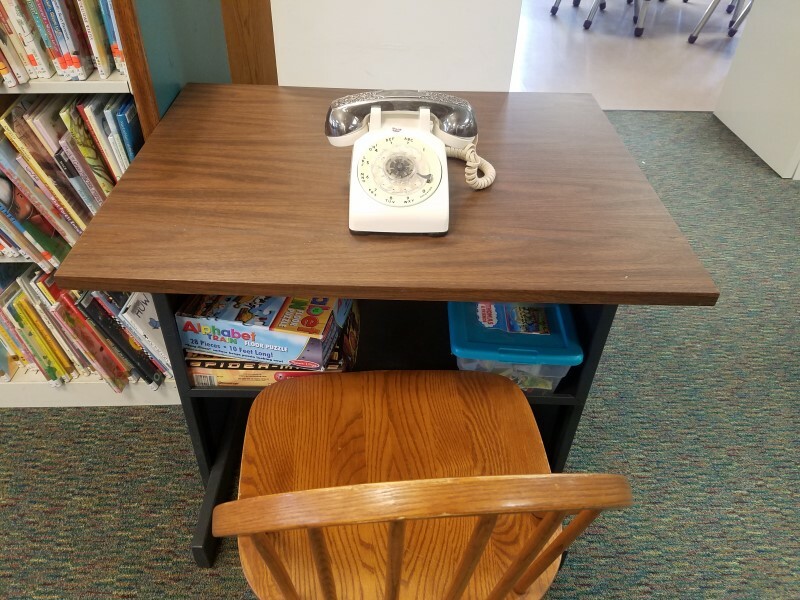 Gather round, children: this is what we called a rotary phone. You couldn't even play Angry Birds on it. All I could picture was a toddler version of this video happening over and over and really, I think the librarian just put it there for her own amusement. Once upon a time, I used to think microfiber was a good idea. We bought a microfiber couch and microfiber dining room chairs, and for a solid two weeks I sang their praises. I would've redone all the surfaces in the house in microfiber if someone would have let me. It was so easy to clean! Everything just wipes right off! Microfiber is easy to clean, but even easier to stain. Literally everything, even water, leaves a gross-looking splotch behind. So unless I clean the dining room chairs after every meal and my living room couch every time someone sits on it, they always look disgusting. We recovered the chairs with a different fabric, but the couch currently looks like garbage and we're okay with that. We've moved past bargaining and depression into acceptance. Recently, one of my children decided to take that acceptance to the next level (and also definitively prove why microfiber is the actual worst) by scratching 'MOM' into the arm of the sofa. Maybe it says 'WOW' and I'm looking at it wrong, but I like to think of it as kind of an ode to me from my little vandals. The kids were invited to a ton of birthday parties this past weekend. Okay, three. But it felt like a ton. I've said before that the dollar store is one of my favorite places for kids' birthday presents because you go in there and let your kids just pick a basket of fun stuff to give them, but do you know what the easiest present is? A ten dollar bill and a candy bar, which is what all our kids' friends received this weekend. Sometimes survival is all about simplicity. I'm not an artist. See this post if you don't believe me. I actually thought I disliked art as much as it disliked me, but back in October I was forced to paint a pumpkin at a kids' event and was surprised that (1) it turned out halfway decent and (2) I actually enjoyed myself. We painted along to an instructional YouTube video, and not only did I have fun I was also happy with the way mine turned out! 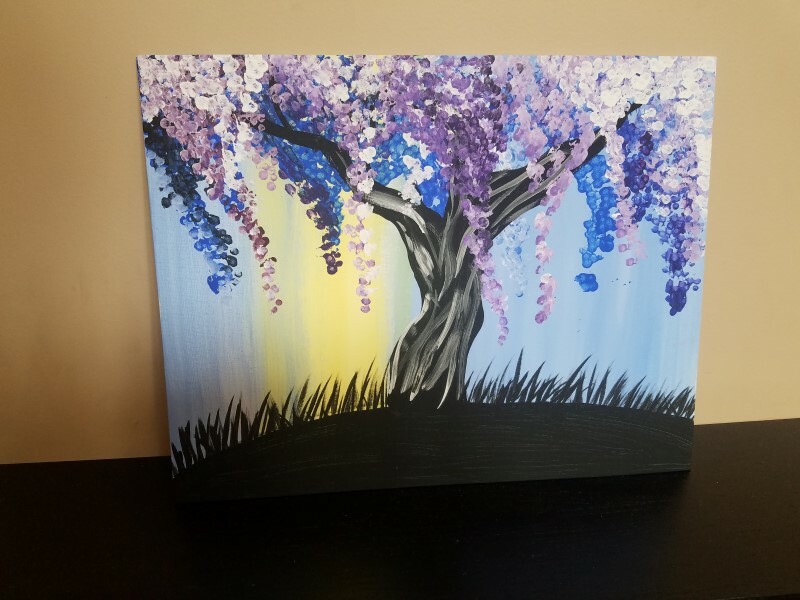 I think I even want to do a paint night with my kids over summer vacation. Someone commented on how it looked like the wind was blowing the leaves, which I'm going to say I totally did on purpose from now on. Don't get the wrong idea. I'm by no means an art maven now. 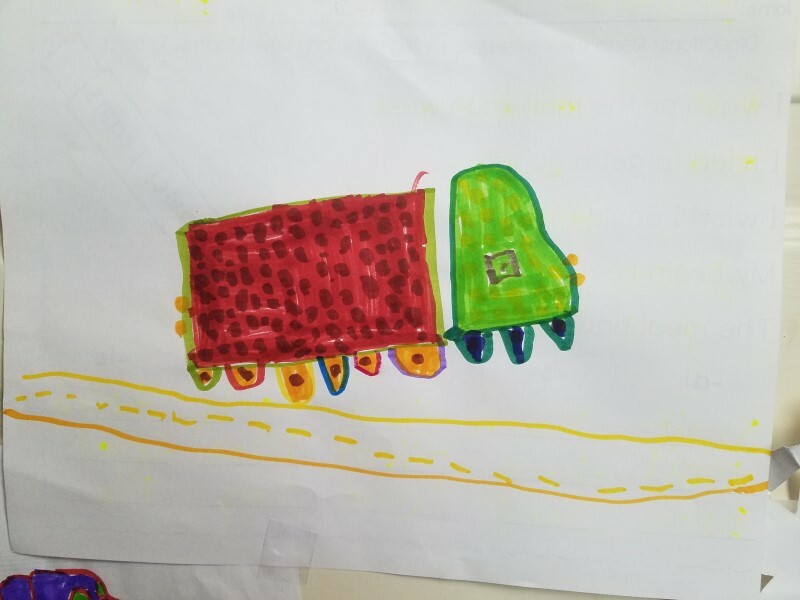 Case in point: my preschooler is into drawing semi trucks. He draws the wheels and trailer, but he can't figure out how to draw the cab so he asks me to do it. When he showed his latest drawing to his 7-year-old sister, she gushed, "Wow, it looks like you did the cab all by yourself this time! Good job!" "No," he said. "Mom did it." When he skipped away, leaving just me and the 7-year-old, I asked her, "Still impressed?" She looked at me gravely and whispered, "No, Mom. That was really bad." Out of the way! 36-year-old art prodigy coming through! Well now I need to know what material is actually good for kids! Almost all of my kids have surpassed me in art ability at this point... It's hard!! I'm also really curious, what the Health Class movies was. I always disliked watching movies in school. I would sit there and think "just let me go home and I can waste my time on something I actually enjoy". That's how I feel about the last 2 weeks of the school year! The movie was Mean Girls, which is PG-13 but I just did not like the raunchy teen comedy feel to it. In addition, I thought it was just... mean! Whether or not it's wrapped up with a nice moral at the end, watching 1.5 hours of meanness normalizes it. Especially since half the time it's part of the comedy of the movie. For clarification, the teacher told me they were going to be discussing bullying and drinking after watching it. Ugh. I feel ya on the microfiber...our couch is so sad. Got a big laugh at the art critique and also very much like the picture. 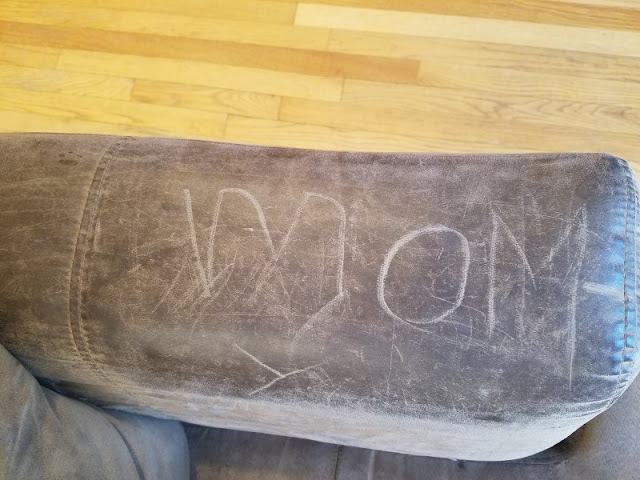 At least your "mom" on your couch will be gone and forgotten 35 years from now. Just yesterday I glanced at the end table in the sewing room. There it still is "Mom is a jerk" courtesy of Jon. No doubt I deserved that many times! Even so I would get happy to forget it. Each of our cushion covers is held in place by 6 plastic pieces that take time to manually take off (and put back on again after washing) so we probably only do it a few times a year. So they probably look good for a week in January and a week in June. Also, the back cushions aren't removable, and as you mentioned the arms and sides... so maybe I should just leave everything alone. You know how when something is clean it just makes the stuff next to it look dirtier? I think that's our couch. My 7-year-old's autograph is on a wood bunk bed upstairs that will probably be there forever. Of course, the message isn't as emotionally charged.